Perhaps you haven’t thought of it quite this way, but saliva is one of the true wonders of the human body. This unassuming fluid performs a variety of tasks to aid digestion and help protect your mouth from disease. And you hardly notice it — except when it’s not there. That’s the case for millions of people in America who have a chronic condition called xerostomia or “dry mouth.” This happens when the salivary glands don’t secrete enough saliva, normally two to four pints daily. Of course, we can experience mouth dryness when we first wake up (saliva flow ebbs while we sleep), feel stressed, use tobacco, or consume alcohol and certain foods like onions or spices. It becomes a problem, though, when periods of low saliva become chronic. Without its preventive capabilities, you’ll be at much higher risk for dental diseases like tooth decay or periodontal (gum) disease. Chronic dry mouth can occur for various reasons: systemic diseases like cancer or autoimmune deficiencies can cause it, as well as radiation or chemotherapy treatments. One of the most common causes, though, is medication, both over-the-counter and prescription. The surgeon general identifies over 500 known drugs that may inhibit saliva production, including some antihistamines, diuretics and antidepressants. It’s often why older people who take more medications than younger people suffer more as a population from dry mouth. Because of its long-term health effects, it’s important to try to boost saliva flow. If your mouth is consistently dry, try to drink more fluids during the day. If you suspect your medication, see if your physician can prescribe a different drug. It also helps to drink a little water before and after taking oral medication. We may also recommend medication or other substances that stimulate saliva or temporarily substitute for it. Xylitol, a natural alcohol sugar that also inhibits bacterial growth, can help relieve dryness. You’ll often find it in gums or mints. 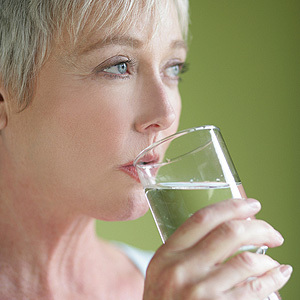 Chronic dry mouth is more than a minor irritation — it can lead to more serious conditions. In addition to these tips, be sure to also keep up your regular dental visits and maintain a daily schedule of oral hygiene to prevent dental disease. Dr. Pamela Reynolds, DDS and Dr. Natalie Layne, DDS are licensed in the state of IL.